Thanks for your review. I’ve been making my own laundry soap for about a year, using either Fels Naptha or Dr. Bronner’s bar soap. The Fels Naptha is too strong a scent for me, and I was looking for more inexpensive option than Dr. Bronner’s. I saw Kirk’s on Amazon for much less and googled “Kirk’s castile soap homemade laundry detergent” and found you. Thanks for putting me at easy about my new castile soap. I’m happy to have found your blog. You seem like my kind of person and am now following you on FB. Thanks! You are welcome!!! I hope you enjoy my Facebook page, too! Do you know if this is friendly for HE washers? Thanks! 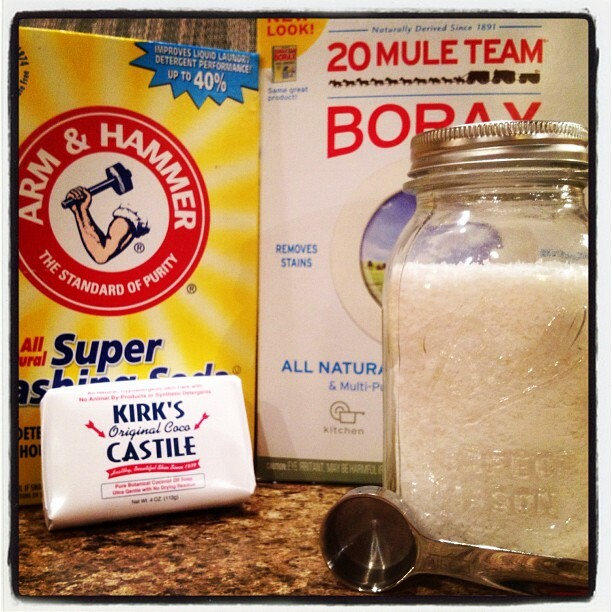 looking to try this….wondering if you had a homemade dishwasher soap you used as well? I don’t have one for dishwasher soap, sorry! I make simple dishwashing tabs. They consist of 2 cups borax, 2 cups washing soda, 1/2 cup Epsom salt, 11/2cups vinegar and 10-20 drops of lemon essential oil. Mix all ingredients together and the press the mixture into 2 ice cube trays. Let sit for 24 hours to dry and voila dishwashing tabs. I store them in a mason jar. Thanks! I will have to try that! Have you noticed any greying of white clothes? Have you noticed in greying of white clothes? Honestly, we don’t have many pieces of white clothing but I haven’t noticed any unusual greying. First time to try this…. can you please give the sizes of the boxes. I just want to make sure I’m mixing the right measurement. Thanks! MAYBE if u added about a quart or so of boiling water to this..MIX REAL GOOD.. and let it cool …then put it into an empty bottle of some sort….u would have liquid laundry detergent…..just a thought…..BUT indeed this concoction sounds real good and I think I’d like to try it. THANKS!